Papergreat: Book cover: "The Vanishing Shadow"
Book cover: "The Vanishing Shadow"
Cover price: Unknown. Dust jacket is clipped. 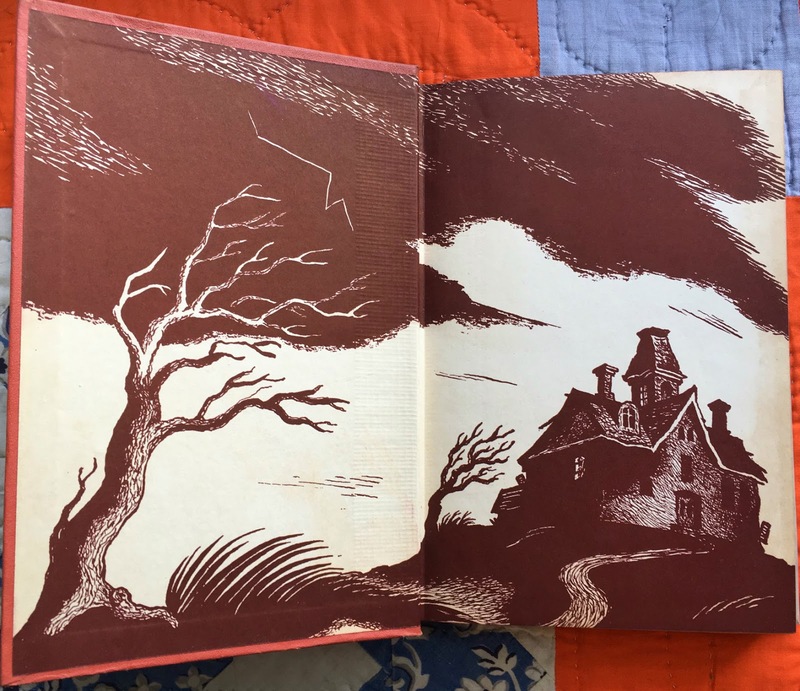 Publication year: This book was first published in 1932, but this edition cannot be from that year, as the dust jacket lists other books in the series that were first published as late as 1946. 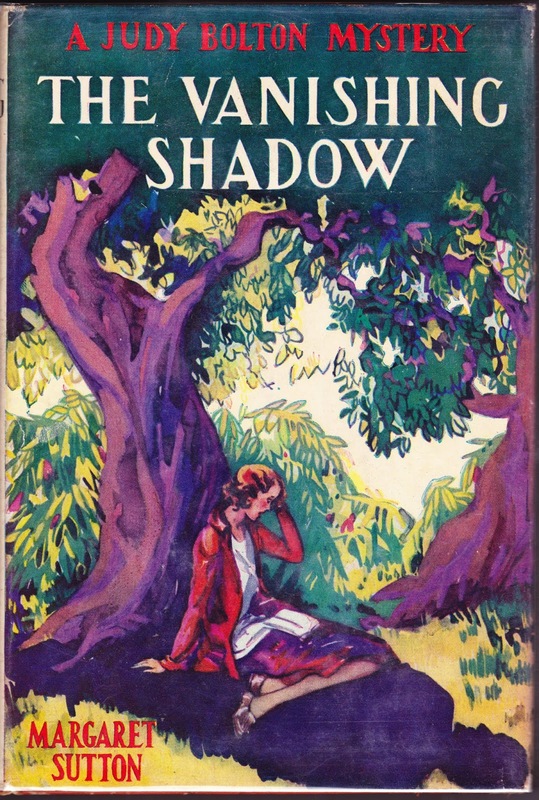 Dust jacket blurb: "Here is a mystery of the shivery sort, adventure that makes the nerves tingle, clever 'detecting,' and a heroine whom all girls will take to their hearts at once." First sentence: "Hey, Judy!" called Lanky Edna Jenkins. "Get your nose out of that book and come to the mail box." Last sentence: Judy waved her hand while Blackberry, who had climbed to her shoulder, waved the black plume that was his tail. Random sentence from middle: And yet, even after they had left the hut, that black cloak and the sinister weapon haunted her. Goodreads review: In 2013, Celeste wrote: "Pretty good, though the mystery itself wasn't that interesting or captivating, and it really bothered me how everyone treated Horace (including himself) for not embodying stereotypically masculine traits. I may or may not read more in the series." Amazon review: In 2008, Arlene wrote: " I started reading the Judy Bolton books when I was ten years old and bought and read them as they were published. They are top of the line books about believable people who have believable adventures. I would recommend them to everyone. Even as an adult (70's +) I believe I will start reading them all over again and share them with my grandchildren." Notes: Margaret Sutton, who has been mentioned before on Papergreat, was the pen name of prolific author Rachel Beebe. She was born on on January 22, 1903, in Odin, Potter County, Pennsylvania. Odin has become so forgotten that it's no longer even on the list of census-designated places (such as Roulette) or unincorporated communities (such as Elmer) within sparsely populated Potter County. ... Rachel Beebe didn't grow up in Odin, however. She was raised in Coudersport, Potter County. (Maybe she put this house into one of her stories.) ... The Judy Bolton Series, all written by Beebe under the Margaret Sutton pen name, consisted of 38 volumes published between 1932 and 1967. The Wikipedia entry on the Judy Bolton series cites an essay by Sally Parry within the 1997 anthology Nancy Drew and Company: Culture, Gender, and Girls' Series. In Parry's essay, she opines that Judy Bolton is a better feminist role model than Nancy Drew because "Nancy Drew is more likely to uphold the ideological status quo, while Judy Bolton is more likely to restore moral rather than legal order, because her mysteries tend to emphasize human relationships over material possessions." Also, unlike Nancy Drew, Judy Bolton often enlists the aid of family members and friends in solving mysteries; she "works in a collaborative way that subverts dominant values," Parry writes. ... On the website Vintage Series Books for Girls ... and a Few for Boys, Jennifer White adds: "The Judy Bolton series never attained the high sales of the Nancy Drew series but did command a very loyal following amongst its many readers. Judy Bolton is a real girl with real emotions and faces many of the same problems that face teenagers. Judy has friends that are both wealthy and poor. The main selling point for the Judy Bolton series was that each adventure was 'based on something that actually happened.'" A bit of kismet: Finally, one of my stops for researching this post was www.judybolton.com and I was surprised to learn that today (October 4, 2018) is the start of a four-day July Bolton Weekend at the Westgate Inn in Coudersport. The website states: "Since 1991, fans have gathered in picturesque Potter County to explore the real life sites that served as inspiration for the Judy Bolton Mystery Series, to discuss the books, and to honor the author." This year's events include a wine-and-cheese reception; a focus on book #19 The Secret of the Musical Tree, a daylong tour of Potter County sites featured in the books; the annual Judy Bolton Trivia Contest; and the presentation of the Susabella Passengers and Friends 2018 Margaret Sutton Writer's Award. The four-day event also coincides with Coudersport's Falling Leaves Outdoor Festival.